Pond cover nets not only keep leaves off the pond in Autumn, but are also a secure protection from animals. Both the Scarecrow and Silent Pond Protector have been tested and proven to work by us. We now have effective protection from herons, cats etc. The Clearview net by Blagdon is a strong black cover net with approx 2cm square holes. An unobtrusive, low visibility pond cover net. Keep out leaves in Autumn and protect your fish from predators. Complete with fixing pegs. Measures 3m x 2m (10' x 6'6). A fine green mesh (listed as 20mm mesh) pond cover net with fixing pegs. Keep out leaves in Autumn and protect your fish from predators. Measures 3m x 4m. The leaf protection net is pulled over the pond before the autumn leaves start to fall. Thus water pollution due to falling leaves and branches is effectively prevented from the very beginning. No musty layer with its putrid gases can form on the pond floor. Stakes are supplied for mounting and tensioning the weather-resistant net. Measures 4m x 3m (13'6" x 10'). A fine green mesh (listed as 20mm mesh) pond cover net with fixing pegs. Keep out leaves in Autumn and protect your fish from predators. Measures 4m x 8m. Measures 6m x 4m (20' x 13'6"). Measures 6m x 5m (20' x 16'6"). A fine green mesh (listed as 20mm mesh) pond cover net with fixing pegs. Keep out leaves in Autumn and protect your fish from predators. Measures 6m x 10m. Measures 10m x 6m (33' x 20'). A tried and tested way to keep unwanted animals and birds out of the garden! Works to scare off Cats, Dogs, Deer, Foxes, Rabbits, Squirrels, Birds and especially Herons from your pond - plus many others. The most intelligent scarecrow ever invented. Detects the heat and movement of an unwanted visitor, both the 4 and 2 footed variety A powerful jet of water is instantly released towards it. The effect of sudden noise, movement and water is both startling and immediate, and animals quickly get out of the area and avoid it in the future. 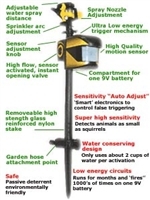 The silent pond protector by Drivall is an easily installed 50m electric fence. It controls animals by giving the heron, cat, dog, fox etc. a controlled, yet harmless electric shock when it comes into contact with the fence. Uses two 1.5V torch batteries. Contains the full kit to protect the average garden pond. Can be extended. A very neat and tidy way to protect the pond without the use of cover nets. Complies with European / British safety standards.